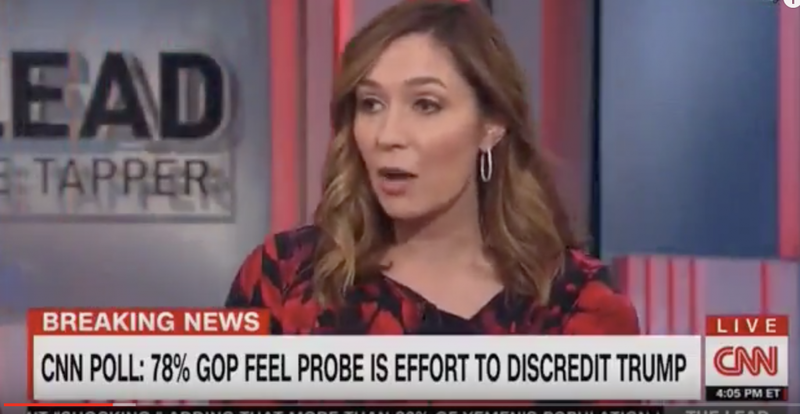 RUSH: Now, CNN Jake Tapper last night spoke with former Ted Cruz communications director Amanda Carpenter and Rebecca Berg, a CNN infobabe, about a new poll that shows that 78% of Republicans believe Robert Mueller’s investigation is an effort to discredit Trump. CARPENTER: Yeah, there’s a lot of effort being put into it. If you asked me this a couple of weeks ago, I would say this is mostly in talk radio and conservative media. But I think we’ve turned the corner a little bit, that more Republicans are getting on board. A big effort from Capitol Hill in Washington to, y’know, have a counter to what Mueller is trying to do, if not get rid of him outright. RUSH: What do you mean “get rid of him”? That’s a made-up Democrat Party headline. There’s not gonna be any firing of Mueller! So talk radio made it up, the fact that Mueller was a bogus investigation. It was talk radio. And I thought that’s all it was, but now all of a sudden she says, “more Republicans are getting on board.” Not because of talk radio! They’re getting on board because after a year and no evidence, the common sense thing to do is to start questioning what the hell is going on! No evidence, in fact, over a year. No indictments, and the only indictments and arrests and plea deals have to do with things that had nothing with Trump and collusion! The common sense thing to do is to say, “What is going on?” Now, here’s Rebecca Berg, a CNN infobabe. Jake Tapper says, “Rebecca, it’s obviously not just President Trump. Congressman Devin Nunes of California, he’s the chairman of the House Intelligence Committee, he told CNN today that it’s no secret that he is investigating the Justice Department, whether there’s corruption at the Justice Department,” corruption with the Democrats and so forth. What do you make of this, Rebecca? BERG: When you look at these numbers of Republicans who are skeptical of the Mueller investigation, when you watch Fox News or listen to conservative talk radio and hear concerns, uh, in those communities on those programs about a, quote-unquote, “deep state” in the Intelligence Committee — concerns that are shared by the president himself — uh, it’s really no surprise that Nunes would be going down this road. Why isn’t the news that Hillary Clinton and her campaign paid for this dossier enough to disqualify it? When we found it know found it that the Hillary campaign and a law firm acting as a cutout, actually hired the MI6 guy to write this dossier that is made up of not one provable thing…? Why wasn’t the fact that Donald Trump’s political opponent created this dossier enough to disqualify it in everybody’s minds as legitimate intelligence? Ponder that.